I am a sucker for gadgets. There is a drawer in the kitchen to prove it. This weekend we were at the Asparagus Festival and a peddler was hawking this vegetable steamer. His fancy patter proclaimed asparagus could be cooked in 30 second with this newfangled contraption. Well I bought hook line and sinker. The operation is simple enough. Place your vegetable is said pouch and push microwave button.' By George' it works perfectly. The asparagus was steamed without any water, oil or fat. 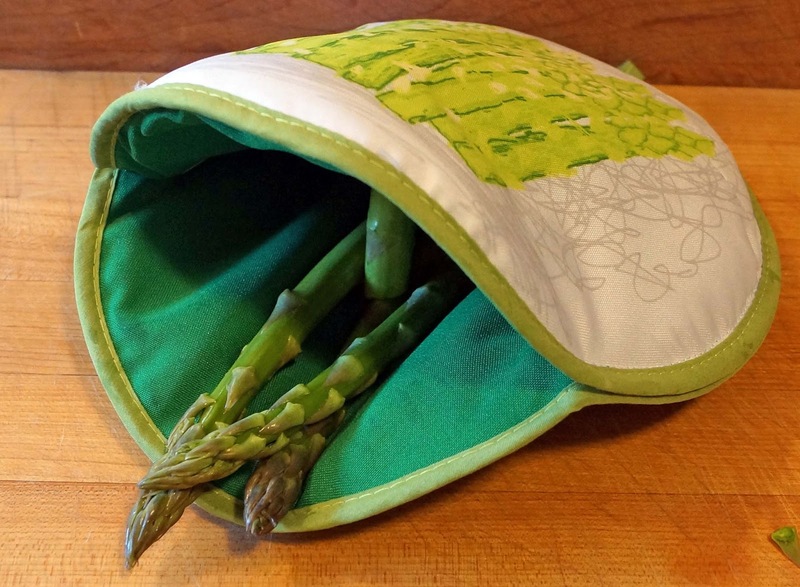 What a healthy and simple way to cook asparagus. I immediately spread butter over my steamed asparagus and then dipped them into mayonnaise. What a treat!!!!!!!! I have a drawer like that in my kitchen, too. I want one! I will give it its own drawer. Do you launder it after using? Zoomie, My drawer runneth over. cookiecrumb, The instructions say it is machine washable. 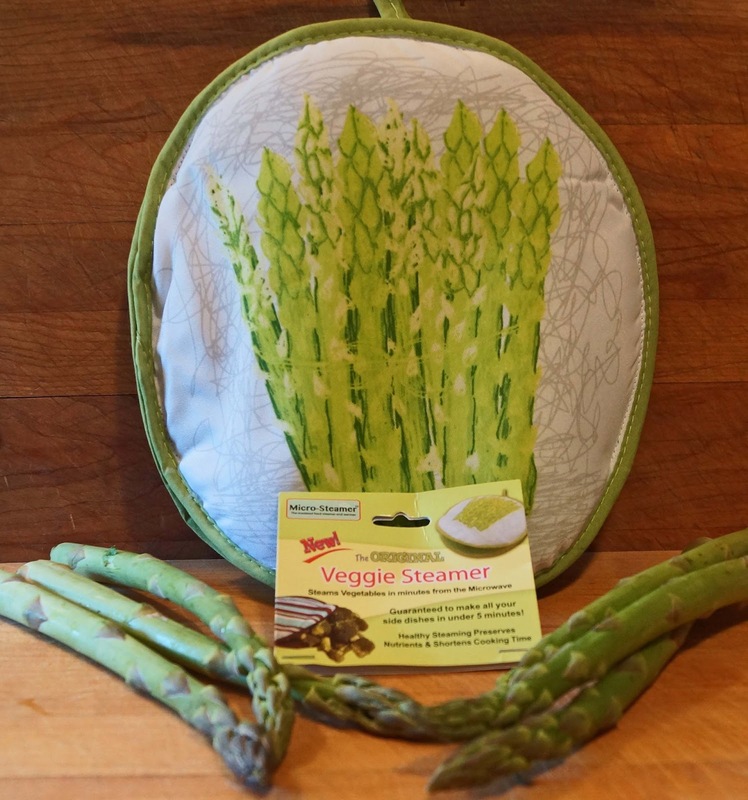 I found one on e-bay but it does not have the cool asparagus graphic. That is a functional work of art. Hang it on the wall between use. That way you have more room in drawer for more gadgets. I did a little research. I believe you could use an oven mitt. Seriously. cookiecurmb, I suppose you could use one of Cranky's dirty socks. (clean might be better) You will not have the cool asparagus picture. Does I have a compartment for heating your Hollindaise sauce? No, no asparagus graphic, but Cranky's socks SMELL like asparagus. Mine smell like rainbow butter. Might use mine. I just want to let you know, that thanks to you, every time I pass by the asparagus at the grocery store I break into song, "This is the dawning of the age of asparagus" ... inside my head of course. Three Dogs BBQ, I wish. That maybe in the next model. Lea Ann, Me too! My voice is so bad they have taken away the karoke microphone. I was thinking it wouldn't work, no way was it going to work. So weird. How does it work...magic? They have these that are tortilla warmers...they are excellent! they are the ultimate food warmer , wars or steams just about anything....tamales, veggies, burritos, ...you name it!